I was lying on the couch next to Doc the other evening while she was watching TV, when a news story jolted me out of my relaxed stupor. There on the television in living color, was a little doggie named Bella Mia wearing a tierra and jewels. Her human was saying she was going to leave her $200,000 when she passed away. But that’s not all, Bella Mia will also inherit the Florida vacation home, her extensive dog wardrobe, jewelry and a trust fund to pay for a caregiver. I looked up at Doc and jokingly told her if that were me, I would be trying to find a way to have that owner declared incompetent so I could get my inheritance early. Doc looked startled then narrowed her eyes and told me that’s why she would never leave me anything but some old dog bones. The more I thought about Bella Mia, it occurred to me that I should contact her. She could probably use a big strong male dog to look out for her and help her spend her money. I was surprised that trying to contact the future heiress was so difficult. She had a publicist for goodness sakes, that told me she would give her the message. After a few days of not hearing from Bella Mia, I decided to go by her mansion for a visit. What I saw next, shocked me. The front yard was full of male dogs of all sizes and colors that must have had the same idea I did. Even I know when there is too much competition, so begrudgingly I left and went home. After telling Doc about my adventure she said, ” What did you expect Grover?” Later on,while laying on the couch, I thought every thing over and came to some conclusions. It wasn’t very nice of me to just go after Bella Mia for her money. Now that she is an heiress, how will she know who really cares about her? I guess having money isn’t all it’s cracked up to be. Father’s day is fast approaching and in honor of all dads, Doc and I are dedicating this weeks blog to all the wonderful father’s out there. My dad Ozzie, a white standard poodle had a brief appearance in my life. My dad lived on the farm down the road from where I was born and I only met him once. But, I know part of who I am is because of him, and for that I am thankful. Doc on the other hand, had a long relationship with her father. Although he has been gone for a while, I love to listen to the stories about him when all the family is together. Apparently he was quite the character. So the other day, when I decided to write this blog, I asked Doc what was the biggest lesson she learned from her father. Without hesitation she answered, “If you want to get rid of the junk at your house, either recycle it, re purpose it, or take it over to your kids house, tell them it is their stuff and leave it”. To illustrate her point, she related the following story. Doc’s first house was built in 1907 and to put it bluntly, it was falling apart. Being naive she took on the projects herself with assistance from family and friends. Deciding she did not want a bathroom with a powder blue toilet, sink and tile, she decided to gut the whole thing. Her parents had recently replaced the two white toilets in their own bathroom’s and thinking she could save some money, she asked her dad if she could have one of the toilets. He told her yes, but said she needed to take them both. Even though she argued with him that she only needed one toilet, he would not give in. Not having the money to spend on a new one, she reluctantly took them, storing one in her shed, where it stayed for years virtually ignored behind the rakes, shovels and lawn mower. Many years later, after Doc’s father passed away she went over to his house, to clean it out and get ready for a garage sale. She decided to bring over the old white toilet to see if she could sell it. As she was taking out some things to the curb for the garbage truck to take away, a couple of men stopped in their truck and asked if they could have some of the things to recycle. With a smirk on her face, she paused, looked over at the old white toilet and said “sure if you take that toilet with you.” They responded that they didn’t really want the toilet, but Doc held firm, “if you don’t take the toilet, you can’t have the stuff.” They looked at each other, hoisted the toilet on to the truck with the other treasures and drove away. Well, like they say, the apple doesn’t fall far from the tree. Happy father’s day! According to a story I read on the Internet, dogs are apparently so fed up with their regular fur coats that they are starting to wear wigs. Now this is news to me as I have not seen this in any Midwest dog parks that Doc and I frequent. 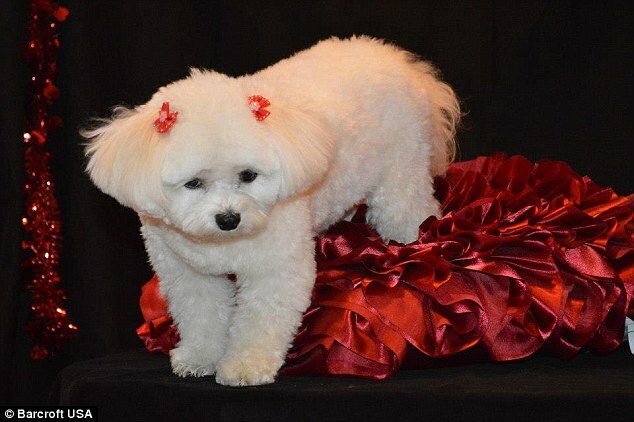 The story reports that a woman who is an 8th generation wig maker and make-up artist to stars, dignitaries and politicians has started making wigs for dogs. If you don’t believe me check out the web page at www.wigglesdogwigs.com. Apparently business is booming. 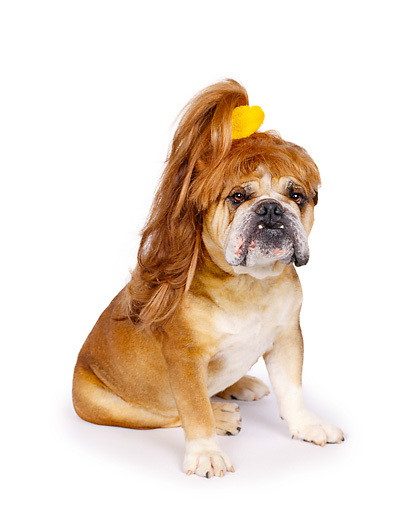 I don’t know where I would go that I would need to wear a wig , but I have seen some dogs that could probably use one. After pondering the idea, I thought it would be fun to have one and wear it for laughs, but Doc is too cheap to buy me one. She told me I can wear an old wig she has in the closet that she wears for Halloween sometimes. I refuse to wear that old ratty thing, how embarrassing. 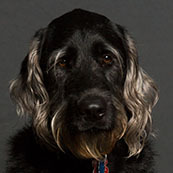 I started wondering how many wigs President Obama’s dogs have. Probably one for every occasion. Not to be outdone by the dogs, there is a new book out for cat owners called Cats in Hats: 30 Knit and Crochet Patterns for Your Kitty. 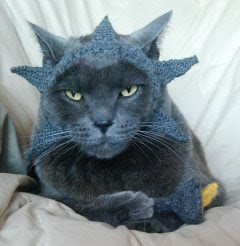 Apparently cat owners have a lot of time on their hands to knit hats for their cats. The author of the book says she can’t knit the hats fast enough to fill the orders so she wrote the book so all the cat lovers could do it themselves. The editorial director at Martha Stewart Living is not surprised by the popularity. (Martha must keep track of this sort of thing in her spare time.) The author reports a pattern book of hats for dogs is not out of the question. So get those knitting needles warmed up people. I’d ask Doc if she’s going to knit a hat for me, but I think we all know what her reply would be. Doc is a “rocker chick” at heart. You’d never know it just looking at her, but I am privy to that secret part of her life. 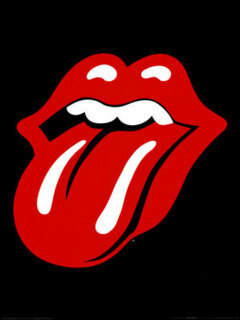 On Saturday mornings she cranks up The Rolling Stones and cleaning becomes a concert event while she sings at the top of her lungs, “It’s Only Rock and Roll But I Like It.” I usually hide under the bed until Mick, Keith, Doc and the band are done performing. Doc loves The Stones so much she has kept every ticket stub from every concert, can tell you all the details, what she was wearing and who she went with. So, it was no surprise to me that when she heard that the band was going out on their ZIP CODE tour this summer, that she went into pre-concert mode. The first people she talked to about the concert, was her family at Sunday dinner. Poor, Doc, all they could talk about was how old the band members were and that they wouldn’t pay those ticket prices to see them. The “too old” comments, kind of ticked her off and I could tell she was a little deflated, but not for long. She found some friends and a couple of family members that wanted to go and then waited in anticipation for the tickets to go on sale. Meanwhile, I was trying to figure out why this concert meant so much to her. I am finding that humans, unlike dogs can be sentimental about things, especially if they bring back memories about happy times. I thought the best way to understand Doc’s obsession with going to this concert was to spend time with the band myself by going on a short leg of the tour. I envisioned riding in the tricked out tour bus to their gigs, or flying on the private jet cuddled up next to Mick Jagger while he rubbed my belly and gave me treats. I figured he could use a therapy dog after dealing with the fans and Keith Richards all day. I even thought it would be a good idea to rename the tour from The ZIP CODE tour to The Dog House Tour. The only problem was that I had no idea of how to get hold of the band, so I went to Doc with my idea. That made perfect sense, and even though I won’t be going on tour, for one summer night, Doc will be in heaven listening to old Stones songs and creating new memories.